I have a hypothesis about the politics of immigration, which is that it doesn't have much to do with immigration policy - on either side of the argument. People don't really have a view about how much immigration there should be, and when you ask them whether there should be more or less, they express almost a pure attitude about culture, race, their economic situation, or whatever. One way to assess this would be to see how public opinion on whether there should be more or less immigration correlates with how much immigration is happening. You'd expect that when the level of immigration decreases, at least some people who'd previously thought there was too much immigration would think there was about the right amount, and so on. On my hypothesis that wouldn't be true. It's not watertight, but it'd be interesting, and I wanted to write a post about it. Unfortunately I couldn't, because there is no consistent polling in Australia on immigration intakes. Here's an inventory of surveys up until about a year ago. The story is basically the same since then: there are patchy surveys, which ask different questions about different types of immigration, and the results are all over the map. We can get some very rough ideas from this, but basically we have very little sense of what Australians think about immigration. Nobody polls this issue because Australian politics never talks about immigration. We talk about refugees instead. The number of asylum seekers arriving by boat was always tiny, not only relative to the population but also relative to the immigration intake, which has doubled since 2003. This is something underappreciated about immigration politics in Australia: although much of the rhetoric about the country's infrastructure and job market being overwhelmed is similar to the immigration debate that occurs in other countries, they don't actually have the same subject matter. It is never an issue in election campaigns whether Australia's regular immigration program should be altered. This isn't a coincidence. In the late 1990s Pauline Hanson whipped up some anti-immigrant xenophobia with her talk about the 'Asian invasion'. In the years that followed, the Liberal Party adopted an extremely harsh line on refugee policy which it increasingly justified using the language used to support general immigration restrictions in other countries. One Nation was kneecapped, and regular immigration has risen steadily without argument, while we tussle endlessly about refugees. So here's the alternative post topic: has this been a good thing or a bad thing? 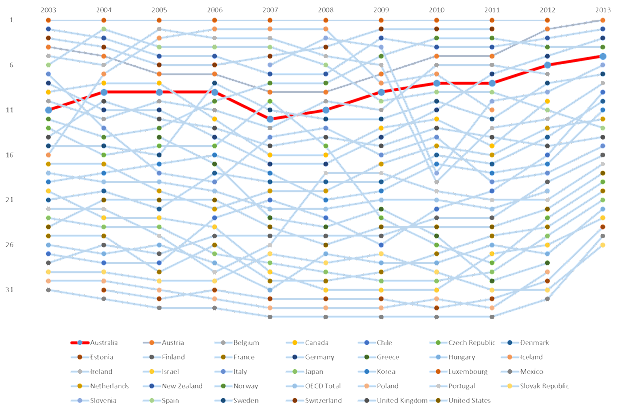 Here's a graph made from OECD data for 2003-13. (It took me ages to make, but is still a kind of mediocre graph - somebody hire me and give me a charts editor!) 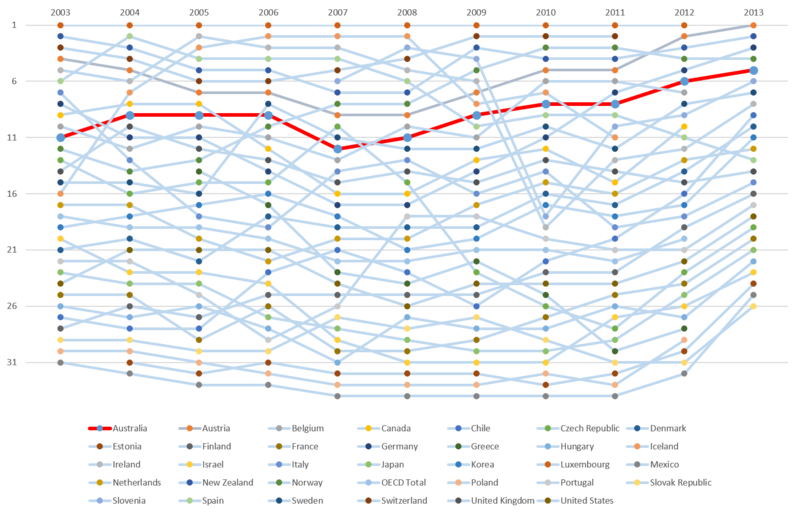 What you're looking at is countries' ranking over time for how generous their immigration intake is. I took the net migration inflow as a percentage of population in each country for each year, then put the countries in rank order. Australia is the red line. You can see straight away that Australia accepts quite a lot of immigrants relative to its peers. And the more you look into it, the more it seems that Australia's political willingness to receive immigration is very high. As I said, the absolute number of immigrants doubled from 2003 to 2013; an increase of only about 25% over the same period in the UK was enough to have massive and ongoing political ramifications. Looking at the countries that consistently rank higher than Australia, two are extremely small (Luxembourg and New Zealand), and most of the others are European. Free movement in the EU means that immigration levels to these countries don't largely reflect an active political choice. (The only parallel for Australia is immigrants from New Zealand, who as far as I can tell aren't included in the statistics for total immigration.) So, to the extent that the question is "how many immigrants do governments choose to admit to the country? ", the answer is that Australian governments tend to do so more than almost all others. So Australia's migration program since the 1990s has delivered significant benefits to millions of people. If there'd been political debate or resentment about immigration, of the kind Pauline Hanson tried to stir up and which exists in most other rich countries, Australia would almost certainly have accepted fewer immigrants and perhaps changed the composition of the flow away from poorer Asian countries and more heavily towards the UK. There are so many unknowns here that I'm reluctant to draw any firm conclusion. We can't know exactly how Australian immigration policy would have differed if it had been subject to political debate. We can't even be totally sure that having an ongoing toxic and confused debate about refugees is what has kept migration more broadly off the agenda. But I think the history pretty strongly suggests that a potential wave of xenophobia and anger about immigration was channeled instead into xenophobia and anger about asylum seekers. Some tradeoff. Of course the ideal would have been to head off the Hanson challenge with honest and compelling argument about the benefits of immigration, persuading voters to support a sizeable immigration intake. And in any case the refugee debate could exist without government policy taking the form of constantly escalating abuse and maltreatment. Accepting more labour migration doesn't begin to justify leaving people in prison camps, with no clean water, to resort to self-harming from lack of hope. But I know people sometimes wonder why Australia, unlike almost every other rich country, has to have such an intensely poisonous and xenophobic discourse about what is ultimately a tiny number of refugees. Maybe the answer is that in this era all Western countries have a poisonous and xenophobic debate somewhere. We've located ours differently to the others - but maybe that's not such a bad thing.